My experience about how to snowmobile Northern Quebec for your snowmobile tour or snowmobile vacation started with a scare. From the shore, the stake line of Regional Trail 322 disappeared into the horizon across the massive Baskatong Reservoir. It looked like it went for miles. And it was glare ice all the way. Although the FCMQ snowmobile trails still had plenty of snow, little was left on Baskatong due to a recent rain. Some engineer must have recently opened the dam gates too. Because the reservoir ice had fallen as its water level plunged a good 20’, judging by the descent from shore to surface. So there we sat on our snow machines, about to burn off our sliders, less than 25 kilometres from launching our Quebec snowmobile tour at Le Village Windigo. Thank goodness for Woody’s studs! We set off, picking our way from snow patch to snow parch, eager to complete this intimidating crossing. But first we had to traverse a long, narrow crack of open water. It was invisible from the shore and ran perpendicular across our direction of travel, barring our way. I wondered whether or not the ice was still safe. The answer appeared to be yes, given that the trail stakes were still solidly planted. Also, we could see ATV’s on the ice dragging fishing huts. Even if they were being removed, at least the ice was still supporting them for now! Several of us skipped over the crack, while others paralleled it to a klick or so towards shore. Then rode around its end on land and back out to the stake line. We were on our way on our Quebec snowmobile tour. But thanks to that mostly bare ice, most of us had to replace sliders two days later in Val-d’Or. These minor annoyances can be expected nearing the end of the season, when avid snowmobilers are looking for one more great snow machine ride. We found ours that March, when Jim Reavell, Don Webb, Glenn King, Dennis Burns, and I toured 2,800 kilometres in a giant 10-day loop on our north central Quebec snowmobile tour. What an incredible last ride! Meanwhile, if you’re looking for more great Quebec snowmobile tour destinations, check out the rest of my Quebec tours. 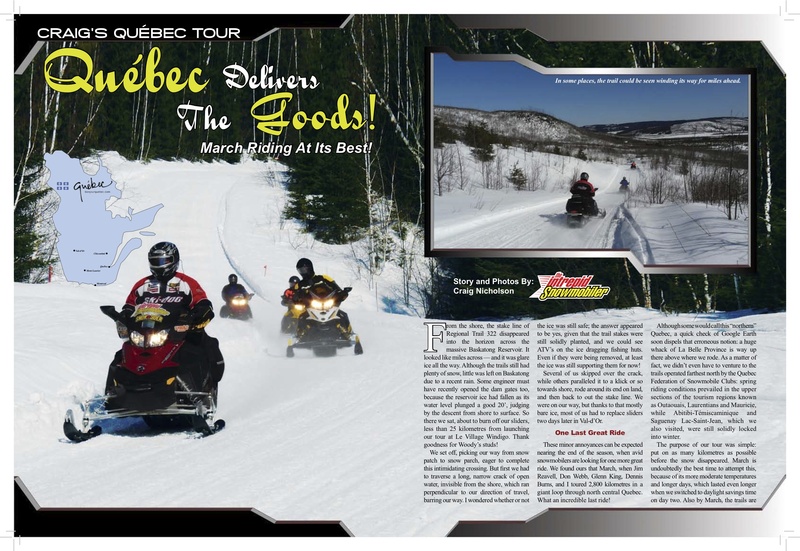 Read my full Quebec snowmobile tour article about this sledding tour on northern FCMQ snowmobile trails as published in Snow Goer Canada magazine. Riders should reconfirm the routes and services mentioned in this Quebec snowmobile tour article as they may have changed since publication.